My other thought on the necessity of God was, is God enough? Sometimes I think the devil knows enough about us Christians to know better than to try to make God not necessary. Instead he tries to convince us that God is not enough. He won’t deny Jesus’ need to die on the cross, but he will try to convince that there are a list if rules we need to follow as well or it’s all for naught. The devil tries to convince us that the Bible has some good stories and possibly some good rules yet they are not the full picture. The devil sprinkles in his lies by adding to what the Bible requires of us and also saying that some requirements are only suggestions or not necessary. He does this in a couple of ways. For the Christian, he tries to convince us that we have to add works to the free gift of salvation in order to be saved. For the non-Christian, he tells us that we have to be a certain way first. Both fly in the face of scripture which tells us that salvation is not based on our works (Ephesians 2:8-10) and that we were given the free gift while still a mess (Romans 5:8). Do I live my life as if God is enough? In 1 word, no. I fail and screw up daily on that. God knows we are not perfect and will mess up a lot. That is the great thing about salvation given by Him. He knows we are screw ups designed in His image and if we starter ting Him, He will begin to shape us and help us to know that He is enough. That does not mean that it will be an easy pain-free process. It just means that we will get a better understanding of who God is and who He wants us to be both individually and corporately as Christians. The other day I had this thought about something my pastor stated on a sermon several weeks back. He mentioned that satan does not try to deny God’s existence but tries to get us to believe that God is not necessary. I took that to heart as I know in my own life everyday I have at least 1 moment where I live as if God is not necessary. My thought the other day was, what if God is necessary? How would we live our lives if we truly believed that. I know that if I want to get to heaven, I have definitely not earned it. I screw up way to often as in multiple times per day every day. My good definitely does not outweigh my bad. All of Christianity lies on the necessity of God. If he wasn’t necessary, then why create us, why send Jesus of Nazareth to die on a cross, why provide a free and easier way for us to get to heaven. If God is necessary, would life begin to have meaning? I know in my life that as much as I live it as if God is not necessary, I find Him very necessary. My life is not perfect and never will be this side of heaven. However, it has meaning and purpose that can only come from God. I have seen Him do so much in my life that can only be attributed to Him and not just a coincident. I am trying to live my life as if God is necessary and will continue to fail everyday. However, I have grown as a better person only because I believe God is necessary and not just some cosmic being who created us and let us to our own devices. 22 Then He said to His disciples, “Therefore I say to you, do not worry about your life, what you will eat; nor about the body, what you will put on. 23 Life is more than food, and the body is more than clothing. 24 Consider the ravens, for they neither sow nor reap, which have neither storehouse nor barn; and God feeds them. Of how much more value are you than the birds? 25 And which of you by worrying can add one cubit to his stature? 26 If you then are not able to do the least, why are you anxious for the rest? 27 Consider the lilies, how they grow: they neither toil nor spin; and yet I say to you, even Solomon in all his glory was not arrayed like one of these. 28 If then God so clothes the grass, which today is in the field and tomorrow is thrown into the oven, how much more will He clothe you, O you of little faith? 29 And do not seek what you should eat or what you should drink, nor have an anxious mind. The passage shows a guy who had means, knowledge, ability, and experience, yet it was all for nothing without God. Since Jesus was the son of God, the visible incarnation of an invisible God, to have a relationship with Him is to have a relationship with God. I recently joined a site called Hone Life. Each week they provide a word and anyone who wishes has 1 week to create some sort of artwork, photo, or writing that is based on that word. Some people may find it hard to be inspired by a single word. While others may have a hard time narrowing down what the artistic piece will look like as so many ideas are running through their heads. Then there are those of us who fall somewhere in between. We know what we want to do with the word given and get to work on it. How easy it is for us to accomplish the idea may vary from person to person. With each submission, we are asked to write something about it whether it is our thoughts or the title of the piece. It can be short or long. Each submission is our reflection or creative spin on the word posted. The submission becomes an inspired piece of art in its own unique way. The first word I participated in was Point. 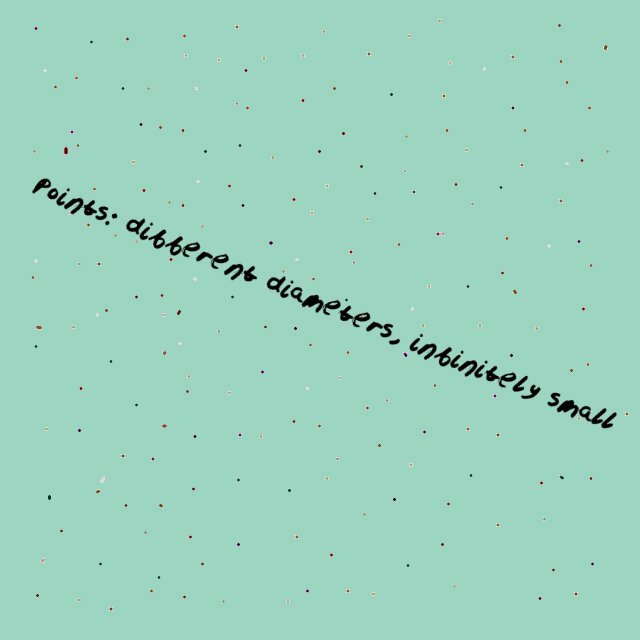 The first thing that came to mind was the fact that points are infinitely small although what they are connected to can be of various shapes and sizes.